Make These My Little Pony Toys Your Little Pony Toys! or form. So, do it! 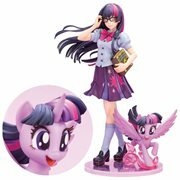 Follow your heart through our extensive MLP collection and choose the delightful Rainbow Dash, Applejack, Fluttershy, or other character action figure, mini-figure, doll, or plush that will light up their life. You'll also find playsets, statues, travel cups and mugs, wall murals, and even pint glasses, and be sure to check out those adorable Pop! Vinyl figures! Odds are that you know some beautiful little girl (or avid collector) who would absolutely love to receive one of these delightful items as a gift... in any way, shape, or form. So, do it! 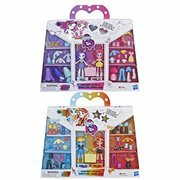 Follow your heart through our extensive MLP collection and choose the delightful Rainbow Dash, Applejack, Fluttershy, or other character action figure, mini-figure, doll, or plush that will light up their life. You'll also find playsets, statues, travel cups and mugs, wall murals, and even pint glasses, and be sure to check out those adorable Pop! Vinyl figures! 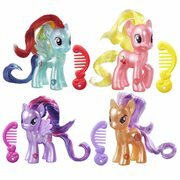 Before My Little Pony in 1982, there was the My Pretty Pony figurine, introduced by Hasbro in 1981. 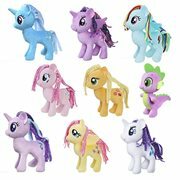 Thus, the immensely popular line of colorful toy ponies marketed to children and the multimedia mega-franchise appealing to fans and collectors of all ages were born. 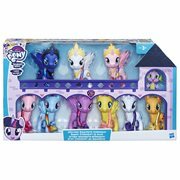 Since then, in movies, animated specials, TV shows like Friendship is Magic, and more, we've seen beloved Ponies like Spike, DJ Pon, Dr. Hooves, Derpy, Firefly, Luna, Lyra, Starlight Glimmer, Princess Celestia, and Twilight Sparkle gallop their way into our homes in the form of MLP merchandise like you'll find here at Entertainment Earth. 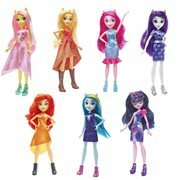 The iconic toy line has been redesigned over the years in what collectors refer to as "generations," with Hasbro launching the fourth incarnation of the franchise in 2010 with the animated series Friendship is Magic. Dolls are among the most sought-after items, but there's a great deal more for kids and collectors to choose from. The list goes on and on, and it includes such diverse products as those mentioned above, as well as creative and developmental toys, playing cards, costumes, aprons, decals, ornaments. Pinkie Pie glassware, figural banks, hats, key chains, magnets, and patches. When Did Your Pony Fandom Begin? Whether you're a fan dating back to the animated TV specials Rescue at Midnight Castle (Firely's Adventure) and Escape from Catrina in the 1980s, My Little Pony Tales from 1992, the 2004 DVD of the original television series, or more recent arrivals like the 2005 live musical The World's Biggest Tea Party and its 2008 DVD release and the parallel-world-based Equestria Girls from 2013, discoveries like you'll find here on the Entertainment Earth website are sure to make you smile and find favor with any wonderful little ladies you might have on your gift list. Hasbro's target demographic for the franchise is young girls and their parents, but Generation Four became a cultural and Internet phenomenon appealing to fans of all ages when the TV show ignited unexpected fandom. This excitement has continued to grow with the myriad of products inspired by the animated musical fantasy film based on the series. That's one reason why there are so many cool Rarity, Princess Cadance, Queen Chrysalis, Spitfire, Sweetie Drops, Sunset Shimmer, and other Pony-themed items available today. There's No End to the Fun! With no end in sight, youngsters and the older fanbase are still clamoring for goodies from the movie, the TV series, and their predecessors - those fabulous My Little Pony must-haves that are so totally adorable and available right here at Entertainment Earth!